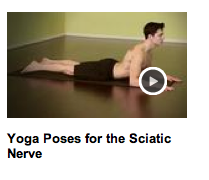 Click on the image here to watch my video for Livestrong.com on yoga poses for sciatic nerve with Juan Castano. I’m Kiki Flynn and this is yoga poses for sciatic nerves. Back pain that travels down one leg is sciatic nerve pain. We can strengthen our overall spine and abs, and take yoga poses for sciatic nerve. We are going to use yoga breathing through the nose. And overall strength particularly we are going to use the strength of the entire spine coordinated with the neck. We are going to start with sphinx pose which gets it’s name of course from the Sphinx in Egypt. Come onto your elbows and hands. And lift your head, neck, chest, everything is lifting up. The shoulders are down and we see the firmness and strength. You want to feel your entire spine strong from your legs, from your feet nice and toned. And through the nose we want to see the yoga breath. We want to experience the chest rising. You can take five breaths here building up to 10 over time. And then slowly come down with an exhalation and rest. The second yoga pose that we are going to look at is locust pose. Inhale everything up head, chest. We see the strength of the spine. The whole form is working simultaneously. That’s a yoga posture. The palms are firm to the floor. The breath is strong. Five to ten breaths and exhale down.